Do you have a Lego fan in your home? Right now at Proverbial Homemaker, you can save 25% on all products during the holiday sale. This includes the brand new Christmas Lego challenge and the popular Bible Lego Challenges. Just use coupon code 25HOLIDAY at checkout. 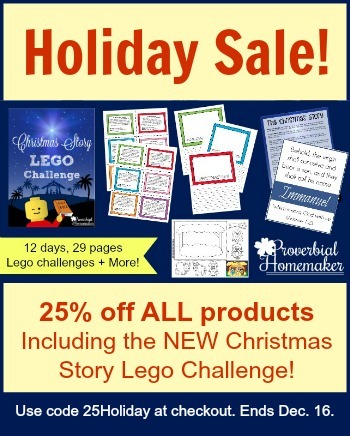 The Lego Challenges include build challenges, copywork, coloring pages, and more! Click here to see the full Lego Challenge deal!